Billy the Tree proudly announces a new selection of WatchCraft Watches is now available with their online stock selection. WatchCraft watches are truly spectacular timepieces. 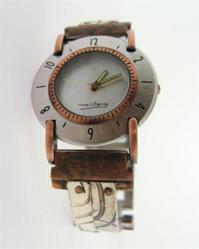 Billy the Tree is proud to announce that they will now carry a vast selection of over 150 WatchCraft Watches online. Their new WatchCraft selection brings yet another unique collection to Billy the Tree’s site. Designed by artist and designer Eduardo Milieris, each watch is handcrafted in the U.S.A and is part of a limited edition collection. Only 1000 timepieces are handcrafted of each style of watch, and each one is individually signed and numbered by Milieris himself. The WatchCraft collection is made from a variety of nickel-free solid jewelers’ brass, embellished with sterling silver, copper, and brass. The metals used to create the watches are distressed and oxidized to give the watches a certain "buried treasure" look, suggesting the reality of constant change and evolution of life. "We’re proud to be a retailer of WatchCraft products," says Billy the Tree’s founder, Robin Weber. "Our company is always on the lookout for unique jewelry and Milieris’ watches really capture something special in his designs." Milieris’ designs strategically utilize different metals that are purposely not sealed. The metals change over time, depending on the wearer of the watch and the surrounding environment they are in, symbolizing the variation of time and the constant variations in life. Billy the Tree ships each WatchCraft watch in a custom, beautiful faux-suede box with a warranty included, as well as a biography of Milieris and a description of the watch purchased.